An Entity Type Attribute defines a per particle attribute attached to an Entity Type, as well as random bounds for setting its values to each Entity of this Entity Type. The value of an Entity Type attribute can be modified in various way (Attribute Behavior, ppExpression...), see ppAttributes Handling for more information. Remember that the value of an Entity Attribute is set at the placement step. See the population tool. It means that these values can be modified manually by selecting particles and editing them in the Component Editor. For more explanation about how to use ppAttributes, see ppAttributes Handling. With the Behavior Editor: Right-click on the Entity Type. The attribute is automatically mapped. 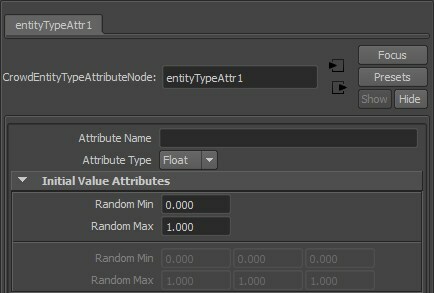 If an Entity Type is selected when the Entity Type Attribute is created, both nodes will be automatically connected.